Beautifully furnished 3 bedroom 2.5 bath colonial style home in Cumberland Foreside. Enjoy the open concept kitchen and sitting room with a wonderful wood stove perfect for entertaining friends and family. Kitchen includes high end stainless appliances, gas range, and items provided for all your cooking needs. Home offers a separate office space perfect for the traveling executive or professional that needs space to work from home. The second level includes an expansive master suite with his and hers closets, private bath, and air conditioning. All bedrooms include top of the line linens, luxury bathrobes, books, and DVD's to enjoy. Walk outside and relax in the comfortable outdoor furniture or have dinner at the outdoor dining table. Neighborhood is safe and welcoming and is walking distance to the ocean at the end of the road. 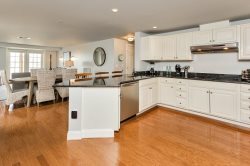 Home is conveniently located on Route 88 within close proximity to Route 1 and I-295 and is 3 miles to Downtown Falmouth and 9 miles to Downtown Portland.